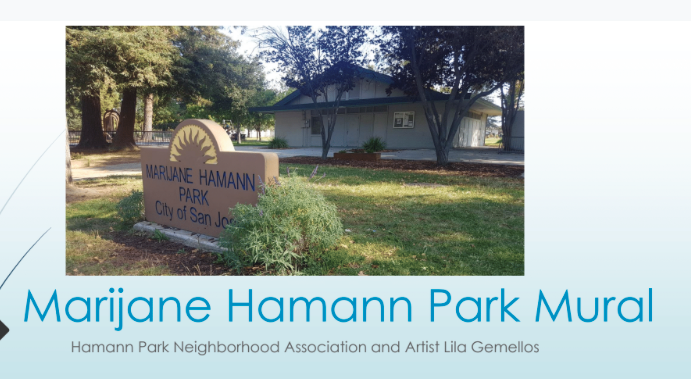 Marijane Hamman Park is going to get a great new colorful artistic addition from the masterful muralist Lila Gemellos. The Hamman Park Neighborhood Association is spearheading the effort to create signature mural for this beloved neighborhood park. The goals is to raise $10,000 from individuals, support groups and businesses to complete the project. Your tax-deductible donation will support this creative endeavor. You'll be a part of something truly unique among San Jose's parks. The plain wall (above right) will be transformed by the colorful design elements immediately above. Is this approved by the city? 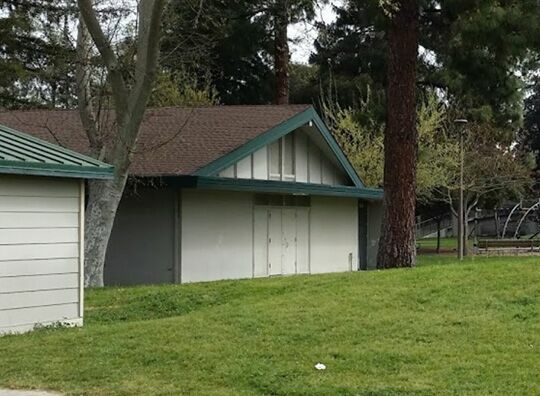 Yes, it was approved by the City of San Jose Public Arts Commission and has the full-support of the Councilmember and Parks Department. When will the process begin for painting the building? As soon as adequate funding is raised (stretch goal is $10k and the minimum is $5k) and the weather cooperates, the project will begin. What other murals has the artist created? Lila's work is highly recommended and examples can be seen at her website, gemellosmurals.com, Or, you can see them at Erickson Park, Falafel's Drive In, Lincoln Ave and Eastridge Mall. What about the risk of it being covered with graffiti? The mural will use TSW. TSW is the industry standard for graffiti protection – because anyone can clean it and the City carries the cleaner. What happens to any extra money that might be raised through this process? Money not used on the project will be used to support HPNA activities, such as National Night Out, neighborhood clean-ups, etc. Our family visits this park almost every day. We're happy to give back for all it has given us. The kids say a mural will make it "more merry". I’m so proud of our neighborhood and those who are striving to make our community a safe community by watching out for each other. Let's make the park an even more beautiful place. This mural will make Mary Jane Hamann park even more beautiful! This is going to be a great complement to the park. If each household in the Hamann Park Neighborhood gives only $20 we will far exceed our goal.